Not the size of the RAM, but the capacity of the TLB. As a matter of fact, I sold my GTX750ti for a 2nd hand 7950 but haven't gotten to install it. I regret it now because if I'd still had the 750, I could have better solved the Compute 3.0 issue. I like the new low power 950's from Asus. Might get one of those additionally to the 7950. @Genoil I'm not familiar with TLB capacities. What's the difference between the 750Ti and the 7950? I like the R7 R370 with 4GB but the hash rate will probably stay far below a 7950. @Marvell9 glad to see everything is working fine. On my side, i'm getting a solid 127MHs but with 1080W on the wall in performance mode. What hashrate did you actually achieve @ 800W? how did you manage to get such a low power consumption? Hello Guys, im new on mining, i downloaded last version of cuda miner, i have gtx 970 card, i run benchamark and its say that my card run at 17/MHs, when i start mining i have 6,8/MHs someone can help me to fix? im going to be mad i have try to add the command ,--cuda-grid-size 8192 --cuda-block-size 128 --cuda-turbo no change at all . ill be glad if someone can explain me where i miss . Thx for rapid answer, in this week ill install new PC with Win 7 and ill give a try, not sure i can install old WDDM 1.0 drivers (347.52) on WIN 10, on driveres page the last result is 352.63 . U save me soo much time really thx mate, ill let u know. I think ill do it in the next week end. i have last question about Hardware lifetime. Normally what is the lifetime of graphic card used for mining? @Gothmor No real limit as far as I know, if you keep the GPU as cool as possible and don't draw from the PSU 24/7 above 80% of max. watt capacity. Hi! Where can i download the latest binary and/or sources of cuda miner? @Marvell9 thanks a lot! Much appreciated! 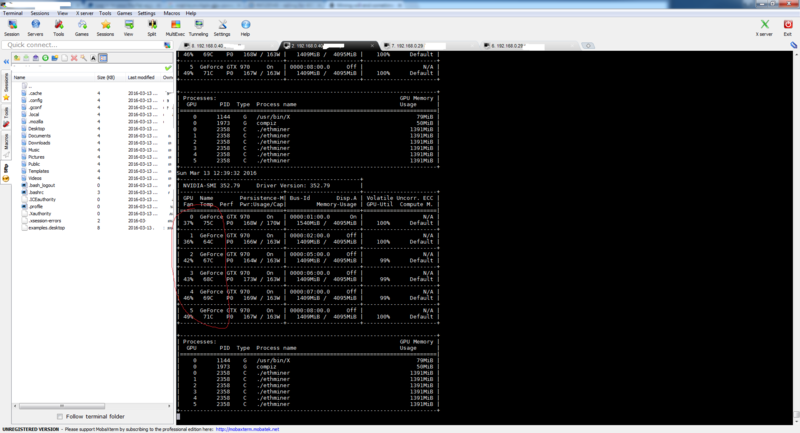 @Genoil i have installed win 7 and now Hash Rate is 17/18 MHs thx a lot mate. My graphic card is working at 99% with 65 C°, is this temperature ok and safe for my hardware? 2. After you installed the drivers you want to use and you receive a popup about new drivers available, run the 'Hide and Show Updates' tool (https://support.microsoft.com/en-us/kb/3073930). Advanced > Turn off Apply repairs automatically > Hide Updates > Select the device driver updates you want to hide and apply. @kenshirothefist sorry for that mate, I'm in the middle of downsizing the repo by removing unused libs and code. Actually it's being done voluntarily by @chfast from the Foundation. I'm pretty sure he's a better C++/ETH developer than I am, so I was assuming it would still compile. I just verify on Windows and it does still build. 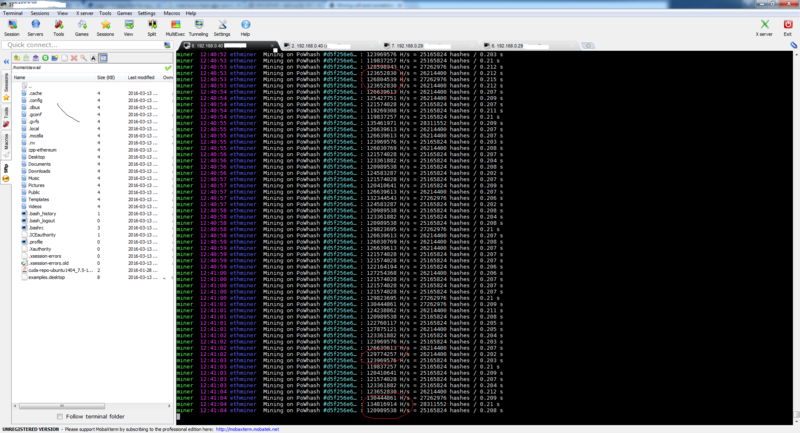 @kenshirothefist I build the CUDA version (for Nvidia GPUs) of ethminer in Ubuntu 15.10 by renaming every number "4" into number "5" near line 115 because CUDA didn't like gcc versions above 4.9. This was my only problem in Ubuntu 15.10 with Nvidia GPUs and I've read anywhere in the forum you are using AMD GPUs so probably this won't help, but I've also installed this depency. But maybe you also need to build cryptoppp as well? @kenshirothefist How did you get 24/26 MH/s with a 7950/7970? Any file editing? Different BIOS? I've ordered one 7950 and one 7970 and this is how I would like to start mining. Any tips for max hash rate? Hey guys, just started mining with my GTX 770 but having a hashrate around 2MH/s... Don't know where it comes from. Any help is appreciated! @eddy4 thanks for the info on 15.10 ... I decided to stick with 14.04, I prefer not to use too hacky methods (I need stable setups too test various rigs on our NiceHash.com service and NiceHash Miner sw). Regarding 24/26 MH/s with a 7950/7970 -> ha, that was a couple of months ago ... now with DAG file increase I get more like 20/22 with a 7950/7970 (both clocked at 1100/1500). are you still having an issue? Yes, searched old drivers for my graphics card as it seems to be one issue but can't find them.. I really don't know what to do.